If you're one of the many people who has trouble finding special Asian ingredients like tamarind paste, not to worry - you can still create delicious pad Thai without it. In fact, the original pad Thai didn't contain tamarind at all (the makings of pad Thai being brought to Thailand via the Chinese), and the following recipe is based on this earlier version of the dish. If you're living in a place where Asian ingredients are difficult to find, then this tamarind-free recipe might just make your day. Enjoy! Place prepared chicken in a bowl and toss with 1 1/2 tablespoons soy sauce. Set aside. Combine pad Thai sauce ingredients together in a cup, stirring well to dissolve sugar. Note that this sauce needs to taste sweet first, followed by sour and then salty to create good pad Thai. Set aside. Bring a large pot of water to boil. Dunk in rice noodles and switch off heat. Allow noodles to soak approximately 6 minutes, or until soft enough to bend easily, but still firm and 'undercooked' by regular standards (this is the key to good pad Thai, so be sure not to over-soak or boil the noodles. They will finish cooking later). Drain and rinse noodles briefly with cold water to keep from sticking. Set aside. Heat a wok or large frying pan over medium-high heat. Drizzle in the oil and swirl around, then add the garlic, chili, galangal/ginger, and half of the green onion (or just the white parts), reserving remaining for later. Stir-fry 1 minute to release the fragrance. Add chicken and stir-fry 3 to 4 minutes, or until cooked. 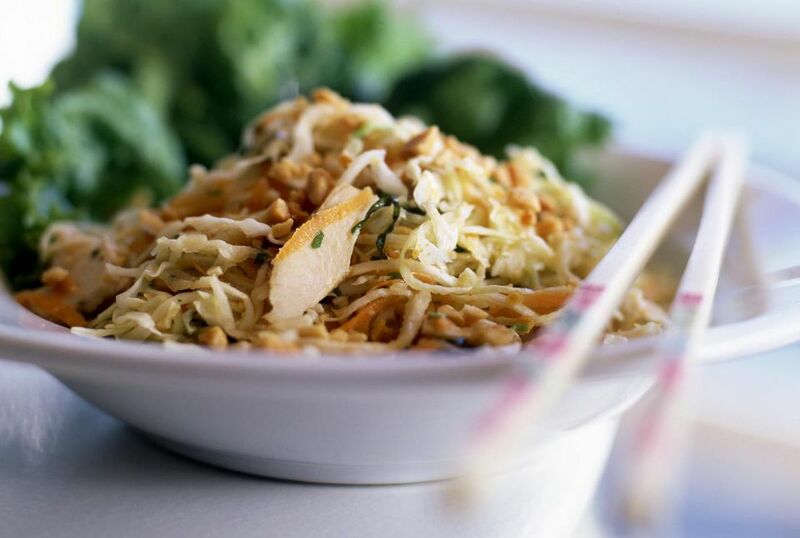 If pan becomes dry, add 1 to 2 tablespoons of the pad Thai sauce, just enough to keep ingredients frying nicely. Push ingredients aside and crack an egg into the center of the pan. Stir quickly to scramble, then combine with other ingredients. Add prepared noodles plus 3 to 4 tablespoons of the pad Thai sauce. Using two utensils, lift and turn noodles to stir-fry and combine with other ingredients. Continue frying in this way, adding more of the sauce every minute or two, until all sauce has been added and the noodles are chewy-delicious and a little bit sticky (8 to 10 minutes). When sauce has been absorbed and noodles are cooked, fold in the bean sprouts (you want them to stay crispy). Remove from heat and taste-test, adding more fish sauce until desired taste is achieved. If you like your pad Thai a bit on the salty side, we recommend adding 1 to 2 tablespoons fish sauce. Portion out onto individual plates and add a lime wedge on the side. Before eating, top with remaining green onion and squeeze over the lime wedge, then finish with a generous sprinkling of chopped/ground nuts. For those who like it extra spicy, serve with Thai chili sauce on the side, and enjoy! Use wheat-free soy sauce for gluten-free diets.